One of the core principles in game design is FRUT inclusion. Before any game designer sits down to design a game, the first thought that comes into their mind is always ‘how can I get some FRUT in this game?’ In fact, in most game design degrees nowadays, a whole academic year is dedicated to the correct implementation of FRUT in the medium of videogames. 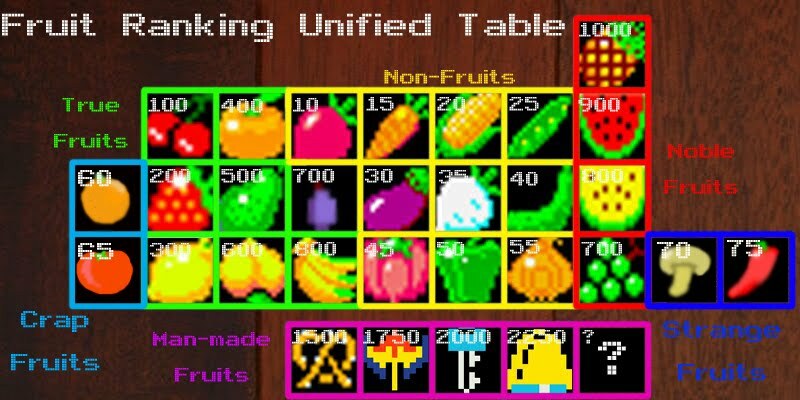 At the core of the correct FRUT inclusion principals is the Fruit Ranking Unified Table. The table denotes the approved proportional points scores for each all all frutz that can be in videogames. These are nice fruits to collect for score, but they’re not proper fruts. Please note that in the man-made fruits section; the forbidden frut ‘FRUTONIUM’ is represented by a ? This fruit must never be put in a videogame because it would award the player with so many points there aren’t enough numbers in the world to satisfactorily display its value and the game would break.